Me gusta la camiseta, estuve a punto de comprarmela. Nice outfit, I think we have the same pair of sunglasses! El look completo me encanta! love that vest! so cute! Ju, this combination is perfect! Who takes your photos cat? I loved the pink pants! Beautiful as always you friend! this is such a fun look! I love that fur lined vest! me encanta tu camiseta. y debes saber q esos pantalones d pitillo t quedan increibles. tienes un cuerpo d modelaza! I love this look! I love love love the sunglasses, vest and tee especially!!! Ah!! The furry hood! So cute. Me encantan el bolso y el chaleco! Que mono el look!! Los zapatos no me podrían gustar más! Son una preciosidad! Los pantalones y los zapatos son geniales. you're so adorable!!!! great look! come by our blog to enter our $100 shopbop giveaway! The whole outfit was made for you, gorgeous! Wow! love yout hair! amazing blog! Julii esta divino el look...la camiseta me encanto!! 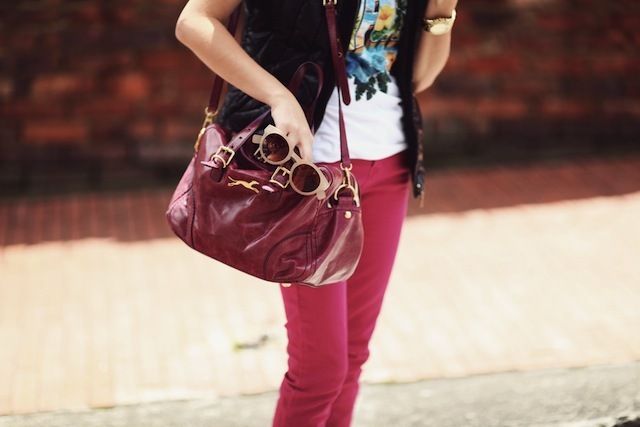 GREAT look - the shoes are so fab and the red of your jeans _ LOVE! I love the pants, and I am definitely digging that vest. It's killer.